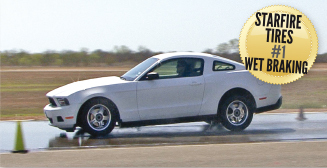 The wet braking test shows the distance it takes for the vehicle to stop under wet conditions. The vehicle approaches at highway speeds of 60mph (96kph) before performing a full ABS stop. Instruments inside the car measure the distance it takes the vehicle to make a complete stop. As you can see the difference between the Starfire Tires and the worst performing Japanese tyres, is 8.82m. The difference is equivalent to 2½ car lengths.